Apple has released the fourth beta version of macOS Mojave 10.14 to users engaged in the MacOS developer beta testing program. The new macOS Mojave developer beta build is 18A336e and, as is usual, has arrived before the accompanying public beta release, which is typically a labeled version behind but otherwise the same software release. Mac users currently running macOS Mojave beta can find macOS Mojave beta 4 available to download now from the Software Update section of System Preferences. And yes, macOS Mojave has removed general system software updates from the Mac App Store Updates section and returned them back to System Preferences, where they were originally in earlier versions of Mac OS X as well. If you’re running the macOS Mojave public beta rather than the developer beta, then the accompanying update to the public beta is also available, versioned as macOS Mojave public beta 3. MacOS Mojave includes a variety of interesting new features for the Mac, including an all new Dark Mode theme, improvements to the Finder and Desktop, along with bringing to the Mac a variety of apps from the iOS world, like Stocks and Voice Memos. 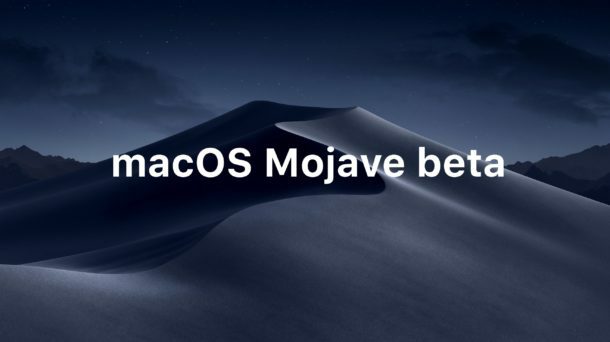 The system requirements for MacOS Mojave are slightly more strict than prior MacOS releases, but for the most part anything released halfway through 2012 or later will run the new operating system. Most beta updates tend to focus on improvements and bug fixes, but sometimes new features and wallpapers can debut as well. In this case, macOS Mojave beta 4 includes a new Dynamic Wallpaper called “Solar Gradients” that appears to shift from various shades of blue, similar to a changing sky. If you’re not running macOS Mojave but that sounds appealing to you, you can mimic the Dynamic Desktop effect by using selective wallpapers. The final version of MacOS Mojave has a release date aimed at this fall. Separately, updates for iOS 12 beta 4, watchOS 5 beta 4, and tvOS 12 beta 4 are also available. This essentially killed the AirPlay display I was using as a second monitor. Frame rate dropped dramatically and a greater than .5 second latency was introduced. As well, VTEncoderXPCService now runs above 100%. Just installed Mojave Beta 3 Public this morning. Installed Beta 4. Looks like plenty of things broken and slow. Have always been so impressed with the Beta’s. Going to have install Public Beta. Update: Did a re-install and seems fine now. Might be slightly off topic to the title, but not too off. Why is Apple PARANOID about the article exposing CPU-Throttling and Over-Heating on MacBookPro with the latest update, including Mojave? Apple is playing draconian on this matter. Apple is behaving almost as if they are Department of Defense and Pentagon being questioned about civilian deaths by our military operation. Is there a $billion fine on Apple from the US Feds and EU waiting on this issue? Because Apple’s PR Army is out in full force to hush this matter. That means, technology and investment media as well as capital market fund managers can make a killing from bribery to stop publishing and publicizing this massive failure of hardware. Is there a collusion between Apple, Investors and Publishing Houses? Racketeering? « How to Get Dynamic Desktops on Any Version of Mac OS – Without Mojave!